Diabetic retinopathy occurs when diabetes damages the tiny blood vessels inside the retina. The retina in the back of the eye functions like film in a camera. A healthy retina is necessary for good vision. Damaged blood vessels leak fluid into the center of the retina, called the macula, where sharp, straight-ahead vision occurs. The fluid makes the macula swell, blurring vision. This condition is called macular edema. When diabetic retinopathy progresses, retinal blood vessels are blocked, depriving areas of the retina with their blood supply and nourishment. This triggers the growth of fragile, abnormal blood vessels. 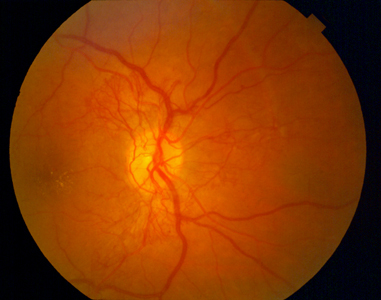 This condition is referred to as proliferative diabetic retinopathy. The abnormal vessels have thin walls and leak blood. This hemorrhaging inside the eye causes severe visual loss. When macular edema is detected, laser surgery is recommended. The ophthalmologist applies focal laser treatment in the areas of retinal leakage surrounding the macula. The treatment stabilizes vision and prevents risk of vision loss by 50 percent. This procedure is usually performed in the office. Proliferative diabetic retinopathy requires extensive laser surgery. Numerous laser pulses are directed at areas of the retina away from the macula, shrinking abnormal blood vessels. These laser treatments help save the central vision. However, some patients may experience diminished side vision, color vision and night vision. If the hemorrhage from proliferative diabetic retinopathy is severe, surgery is needed to evacuate blood from inside the eye. This procedure is called a vitrectomy. Although lasers and surgery are highly effective in reducing vision loss, they do not cure diabetic retinopathy. Researchers are studying drugs that may stop abnormal blood vessel growth. Someday, medication may help people control their diabetic retinopathy and reduce the need for laser or surgical treatments. Everyone with diabetes is urged to have a comprehensive dilated eye examination at least once a year. Medicare and most health insurance plans recognize these examinations as medically necessary. Studies have shown that better control of blood sugar levels slows the onset and progression of diabetic retinopathy. Controlling elevated blood pressure and cholesterol can also reduce the risk of vision loss.